Back in October 2015, I wrote a blog post discussing our investments regarding FreeBSD running on Hyper-V as a virtual machine. We have done a tremendous amount of work over the past couple of years to make FreeBSD a 1st class VM guest on Hyper-V, enabling performant networking and storage capabilities that for the first time, made it possible to run production FreeBSD workloads in Hyper-V environments. Completing this work at this time made it possible for Microsoft to declare official support FreeBSD as a guest on Hyper-V, meaning customers could call Microsoft Support if needed. One of our primary reasons for making these investments in FreeBSD on Hyper-V was to enable FreeBSD VMs to run in Azure, as Hyper-V is the virtualization platform for Azure. You may be wondering, “Why is it so important for FreeBSD to run in Azure?” Many top-tier virtual appliance vendors base their products on the FreeBSD operating system. Over the past 2 years, we’ve worked closely with Citrix Systems, Array Networks, Stormshield, Gemalto and Netgate to bring their virtual appliances to the Azure Marketplace, and we’re continuing to work with a long list of others for future offerings. However, if you wanted to run your own FreeBSD image in Azure, your only option so far was to bring a custom image from outside of Azure. Here’s how easy it is to get up and going through the Azure portal. Simply click on the +New on the left pane (or the marketplace tile on your dashboard), type “FreeBSD 10.3” in the search text box, and you’re there. As the above screenshot illustrates, Microsoft is the publisher of the FreeBSD image in the marketplace rather than the FreeBSD Foundation. The FreeBSD Foundation is supported by donations from the FreeBSD community, including companies that build their solutions on FreeBSD. They are not a solution provider or an ISV with a support organization but rather rely on a very active community that support one another. In order to ensure our customers have an enterprise SLA for their FreeBSD VMs running in Azure, we took on the work of building, testing, releasing and maintaining the image in order to remove that burden from the Foundation. We will continue to partner closely with the Foundation as we make further investments in FreeBSD on Hyper-V and in Azure. 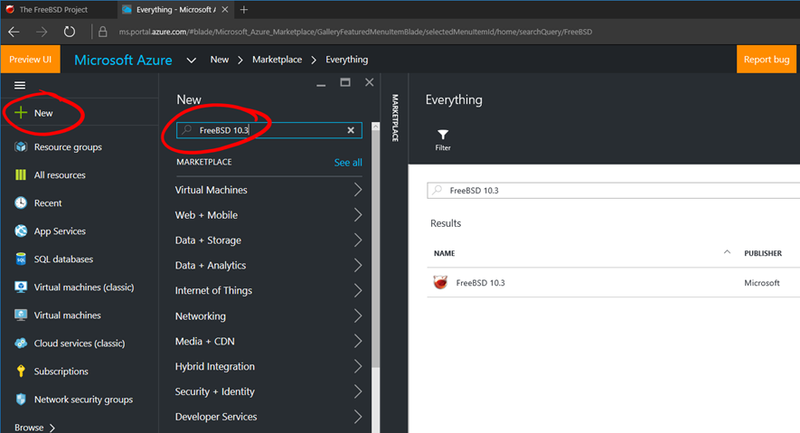 "It's quite a significant milestone for FreeBSD community and for Microsoft to publish a supported FreeBSD image on Azure Marketplace. We really appreciate Microsoft's commitment and investment in FreeBSD project". What’s Different About the FreeBSD 10.3 Image from Microsoft? What About Older Versions of FreeBSD? As for future versions of FreeBSD, our intent is to stay current and make available the latest releases shortly after they are released by the FreeBSD Release Engineering team. We are continuing to make investments to further tune performance on storage, as well as adding new Hyper-V features – stay tuned for more information on this!